The SafetySure Double Notched Plastic Transfer Board notches secure the plastic transfer board to the upright portion of the wheelchair air. 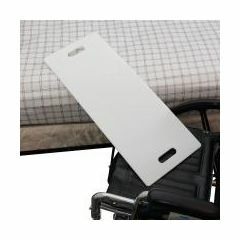 Notched transfer board can be used with either standard arm or desk arm wheelchairs. Double notches allow the patient transfer board to be used on either the right side or left side of the wheelchair. Finished with a smooth plastic finish. Available in length 29". The 29" transfer board has two built in handles. Supports up to 300 lbs. Due to lead time, please allow up to 10 - 14 days for delivery. This product is a special item and is non-returnable. Good Value. Durable. High Quality. Solid Construction. Easy to Control. I'm a physical therapist with 30 years experience in long term care. This is THE BEST board I have ever used. It is thin and easy to place--that is HUGE, esp. with large or highly dependent people. The flexibility makes it easier to use between uneven surfaces, easier to remove after the transfer. It is short, and this also helps one pull out the board once the transfer is completed. It is slick, making transfers easy. We all fight over the board at work (management should buy more!) This is a must have for anyone who needs to use a transfer board. Don't waste your money on the plastic with ridges board--that one is awful. Easy to insert. Light Weight. Attractive. Makes transfers easy. Easy to clean. Comes out easily. Wheelchair to bed. By itself. On top of other boards. Bed to wheelchair. To tub transfer bench. Getting into car. Everything about this product is great, but the most amazing thing is how easily it slips out from under the patient compared to other products. It really does work just as advertised. Buyers should note that this board should not be used to span distances greater than 1/3 the length of the board, but this is not a problem, because a longer board can be placed underneath to provide stability in those situations. price. Added width. Good slide surface. Tape secures bottom. Good for wheelchair to car and back. Extra width provide stability for an older paraplegic. Good slideability. Why did I wait so long to buy one! Transferring in the vehicle! My wife slides sooo easily on it. Great product! I am wondering what the weight capacity is of this type of transfer board. Would you recommend the Safety Sure Transfer Board for a stroke patient with left side paralysis? No, I prefer the standard ribbed type, the other is to slippery. I purchased both types due to a surgery recovery, I no longer need one...But The ribbed type was much safer. It would work IF patient had assistance using the transfer board, especially in pulling it out from underneath him/her after transfer was completed. Otherwise, if one side is paralyzed, it might be too hard for him/her to remove by themselves. I bought a number of boards and this one seems to be the one mom like and transfers easier with the only think I do not like is the board is to big but we use it 99% of the time.